Columbia Gorge is formed where the Columbia River cuts through the Cascade Mountain Range, 80 mile section of which is designated as a National Scenic Area. This article covers the southern bank which is entirely within the state of Oregon. 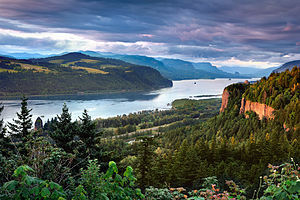 Along the route Lewis and Clark pioneered on their trailblazing journey in 1805, the Columbia Gorge cuts through the Cascade mountain range which is made largely of volcanic (basalt) rock, leading to a number of spectacular cliffs. The bountiful presence of water on the west side of the Cascades leads to a number of very tall waterfalls which intersect the river. The key distinguisher of climate in the gorge is Wind. Wind speeds are often upwards of 30mph. This is because the gorge is a wind tunnel from the warm/dry east end to the cooler/damp west end. A large number of wind turbines have been installed on the ridges of both sides of the Gorge to take advantage of the power of the winds in this area. The unique setting of the Gorge is partly due to repeated mass floodings at the end of the last ice age, when the collapse of ice dams near Missoula, Montana caused walls of water over 1000 feet high at the east end of the gorge, which were still over 2000 feet deep when they reached present-day Portland. 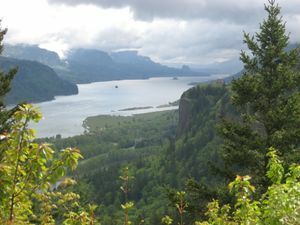 The region is included in the Columbia River Gorge National Scenic Area  which protects the scenic quality of the region by requiring most new development to occur inside of existing towns. Easily accessible from Portland (Oregon), take the I-205 North exit 288 toward the Dalles. Merge onto I-84 East exit 22 toward the Dalles/Mt Hood. Interstate 84 is a great way to get around the gorge. Be sure to meander on the side roads like the "Old Columbia Highway" (Route 30), by taking exit 18 toward Lewis and Clark State Park/ Oxbow Regional Park. Take a left onto Crown Point Highway. Then take a right onto East Columbia River Highway. 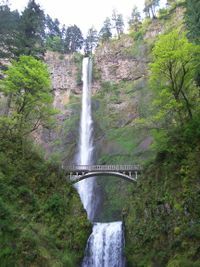 This road passes by multiple scenic locations such as Multnomah Falls, Punchbowl Falls, Eagle Creek and more. Bonneville Lock and Dam . The third highest hydropower project in the US, at about 1.2 MWatts. Accessible via exit 40 on I-84, you can visit the dam (after passing a friendly guard who will inspect your car) as well as a fish ladder installed by the Army Corps of Engineers. Salmon run in the river almost year-round, but the fall is peak season. The Fruit Loop south of Hood River passes many fresh fruit stands in season. Many windsurf on the Columbia River due to its consistent strong winds. Hiking trails abound, with many steep climbs gaining up to 4000 feet. Eagle Creek is the most famous hike, passing many waterfalls, including one where the trail goes through a tunnel behind the waterfall. The Portland Hikers Field Guide  is a great hikers resource for trails. Hood River has many restaurants serving a wide variety of food, but good restaurants can also be found in Bingen and Stevenson, on the Washington (north) side of the Gorge. The region is famous for craft beers and is developing a reputation for its wine as well, particularly in the eastern end, where many wineries are concentrated around the small town of Lyle. This page was last edited on 20 September 2013, at 08:31.